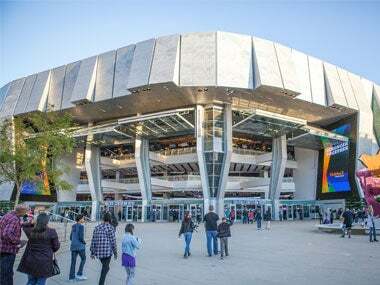 Sacramento, Calif.— Beginning Friday, June 30, Golden 1 Center will offer a behind-the-scenes look at the venue with public and private walking tours. Guests will explore the technology and sustainability innovations, select areas dedicated to the Sacramento Kings, and unique elements of the arena that reflect the region on a Guided VIP tour. Kings Mascot Slamson and the Sacramento Kings Dancers will tipoff the first set of tours on Friday with a special celebration and Golden 1 Center treats for each guest. Tickets can be bought on Ticketmaster.com, Golden1Center.com/Tours, or at the arena Box Office. Private VIP Group tours can also be purchased by contacting Director of Private Events and Tours, Vickie Eiges by email at [email protected] or by phone at (916) 701-5284. The 90 minute tour will focus on various themes such as Farm-to-Fork, art, design and architecture. With inside looks at the Kings Locker Room and more special places throughout the arena, guests will not only hear the facts about “Sports Business Journal’s Facility of the Year,” but will witness firsthand the many hidden features of the arena. Tours will be offered daily, while tour dates, times and routes are subject to change based on events scheduled, team practices and other venue operations. Starting in mid July, Spanish speaking tours will also be available. For more information and available tours, visit Golden1Center.com/Tours.